The portable ScanSnap S1300i from Fujitsu provides PC and Mac users the tools to be productive and paperless, anywhere. 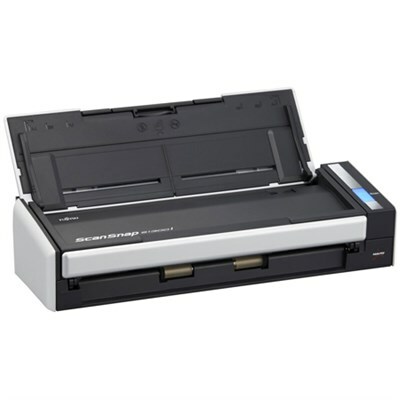 The ScanSnap S1300i is the smallest multi-page double-sided ScanSnap scanner for one-button ease of use at the desk or on the road. Stack up to 10 pages into the automatic document feeder (ADF) and press the blue button. After scanning is complete, the selectable Quick Menu appears to allow users to smoothly transition between different scanning intentions without complication or guesswork. The ScanSnap S1300i features a powerful set of automated image processing functions including Auto skew correction, Auto orientation, and Auto color detection. These intelligent features work behind the scenes to help ensure scanned content looks great without effort. Make a quick alteration and enhance productivity by scanning paperwork with machine-print back into an editable version with the included ABBYY FineReader for ScanSnap software for PC and Mac. The ScanSnap S1300i provides users direct scanning to Evernote and Google Docs, as well as Salesforce CRM and SharePoint Online (for Windows). It also brings two additional cloud syncing functions: Scan to SugarSync and Scan to Salesforce CRM. Now you can seamlessly scan and save your scanned files to the cloud for fast and easy accessibility from just about anywhere. ScanSnap S1300i comes with an AC Adapter but for added mobile convenience, the ScanSnap S1300i can be powered though the computer's USB ports when an AC port is not available. Scan to Mobile - Like all current ScanSnap models, the S1300i can scan to cloud services Evernote, Google Docs, Salesforce CRM, SugarSync and SharePoint Online (for Windows).